Dec 18, 2017 – On Dec 5, 2017, the Court issued an order vacating the temporary restraining order that prohibited the City’s proposed abatement and demolition of the buildings at the Vail Court property. 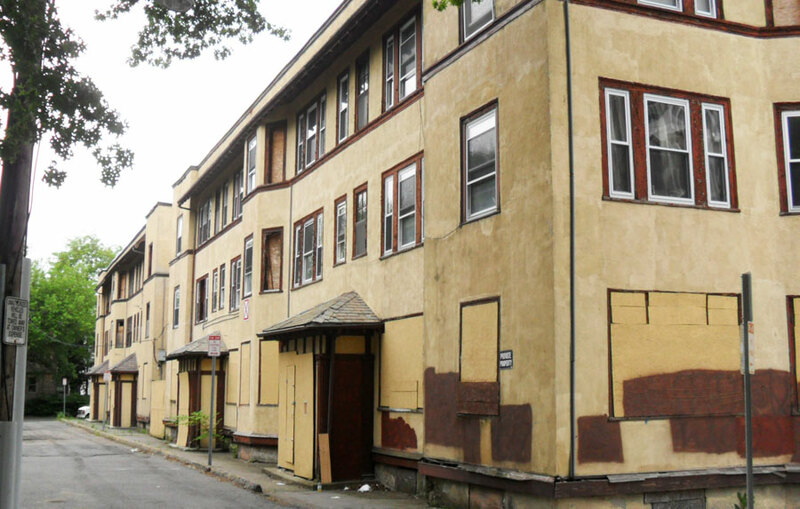 Accordingly, the City may now proceed with the planned abatement demolition of the buildings. While the Court has vacated the temporary restraining order issued earlier this year, the litigation brought by the former owner against the City in this matter is still pending. 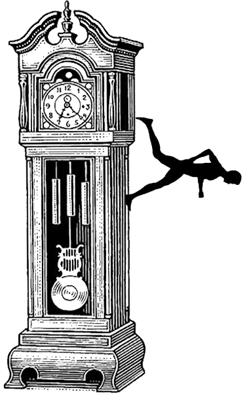 We cannot predict how long this challenge will be pending, however can say that litigation like this can often take considerable time to resolve. The City will continue to vigorously defend against this challenge to the City’s ownership of the property. However, as the litigation is still active, we believe the best course of action at this time is to continue to delay the process to plan for the redevelopment of the property as affordable housing.The City and the Affordable Housing Trust will monitor the status of the litigation, and, when advisable, reengage with the community. As was discussed at the last community meeting, both the City and the Trust remain committed to holding a second public meeting to gather more community input to be considered in the redevelopment of the property as affordable housing, and will do so at the appropriate time. The City remains committed to moving forward with building new affordable housing at the property as swiftly as possible, however must move forward in a manner that acknowledges the active legal challenge to this effort. The Conservation Commission is responsible for the administration of the Massachusetts Wetlands Protection Act (WPA), a state law governing activities in and immediately adjacent to local wetlands, waterways and floodplains. 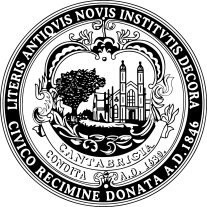 The Commission holds two regularly scheduled public meetings each month to review permit applications under the WPA, issue permits, and conduct other business related to the management of Cambridge’s natural resource areas. The deadline for submitting applications for both commission vacancies is Friday, January 12, 2018. Applications to serve on these committees can be submitted to City Manager Louis A. DePasquale using the City’s online application system at cambridgema.gov/apply. A cover letter and resume or applicable experience can be submitted during the online application process. Paper applications are available in the City Manager’s Office at Cambridge City Hall, 795 Mass. 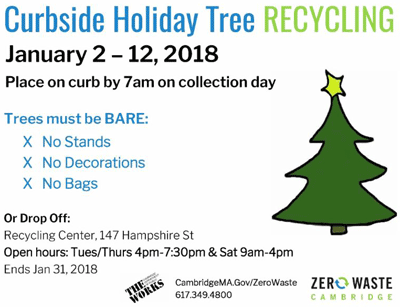 Ave.
Curbside collection of bare holiday trees (weather permitting), will take place January 2nd, 2018 – January 12th, 2018 on your regular trash/recycling day. Decorations and stands must be removed and trees should not be in a plastic bag. Residents can also bring bare trees to the Recycling Center during open hours (Tues/Thurs 4pm-7:30pm and Sat 9am-4pm) from December 26th – January 31st. Dec 13, 2017 – The results are in for the fourth Participatory Budget (PB) Process. Over 6,778 Cambridge residents age 12 and older voted to decide how to spend $800,000 on capital projects to improve the community – a 43% increase from last year. Participatory Budgeting is a democratic process through which community members directly decide how to spend part of a public budget. The goal of PB is to directly involve residents in the budgeting and City-building process, foster civic engagement and community spirit, and help ensure that the City’s Capital Plan reflects the priorities of Cambridge residents. Many thanks to the PB Outreach Committee, Budget Delegates and Facilitators, City staff, and all of the volunteers and participants who helped make the City’s third PB cycle a success. The deadline for submitting an application to serve on the Task Force is Fri, Jan 19, 2018. Applications can be submitted to City Manager Louis A. DePasquale using the City’s online application system at cambridgema.gov/apply. A cover letter describing your interest, resume, or applicable experience can be submitted during the online application process. Paper applications are available in the City Manager’s Office at Cambridge City Hall, 795 Mass. Ave.
Reuse the cardboard box in which you’ve received a shipment, collect clothes and shoes you no longer want. Visit Give Back Box to print a free shipping label. Then, UPS or USPS will ship your donation to charity. Nov 20, 2017 – The City of Cambridge has been awarded the 2017 “Deal of the Year” by The Bond Buyer in the non-traditional financing category. The annual Deal of the Year Awards recognize innovation in municipal finance and attract submissions from government and municipal bond issuers across the country. This award recognizes Cambridge’s new Minibond program, which offers City of Cambridge bonds directly to Cambridge residents. The bonds funded city-wide capital projects including school building renovations, municipal facility upgrades, and implementation of Cambridge’s “Complete Streets” plan. The City offered $2 million of Minibonds with a $1000 minimum size, much lower than the standard $5000 minimum denominations of most municipal bond offerings. Southeast Region: The Kentucky Economic Development Finance Authority’s $472 million deal to is the first new use of commercial bond insurance and first use of a surety in place of a Debt Service Reserve Fund in a non-profit healthcare finance since the credit crisis a decade ago. 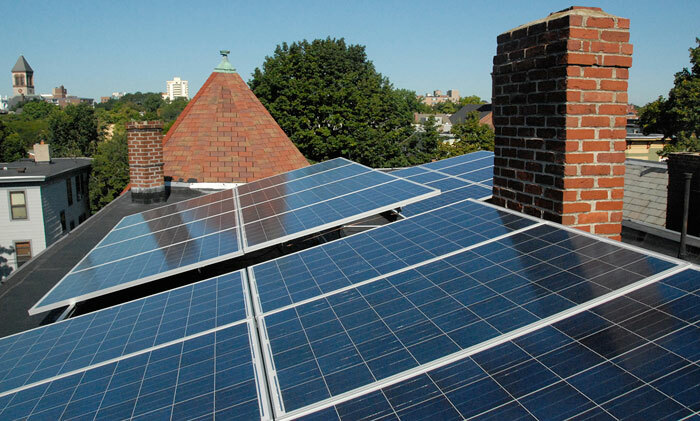 Learn more about Cambridge’s Minibond program at http://minibonds.cambridgema.gov/faqs. Manager’s Agenda #3. A communication transmitted from Louis A. DePasquale, City Manager, relative to a legal opinion relative to the City Manager’s authority to make Historical Commission appointments. Manager’s Agenda #4. A communication transmitted from Louis A. DePasquale, City Manager, relative to the Final Landmark Designation Report for the Harvard Square Kiosk. Manager’s Agenda #5. Transmitting communication from Louis A. DePasquale, City Manager, relative to the appropriation of $444,534.67 from the Hubway Capital Projects Equipment Fund to the Community Development Department Public Investment Fund Extraordinary Expenditures Account. These funds will be used for the purchase and expenses of Hubway bikeshare equipment. These funds represent the donor agreement revenues and will contribute to the purchase, installation and maintenance of approximately 10 additional stations and bicycles, pending identification of acceptable locations. Manager’s Agenda #6. Transmitting communication from Louis A. DePasquale, City Manager, relative to the appropriation of $489,780 associated with the Hubway Bike Share Equipment from the Mitigation Revenue Stabilization Fund to the Public Investment Fund Community Development Extraordinary Expenditures account. These mitigation funds will be used for the purchase and expenses of Hubway bikeshare equipment. That’s nearly a million dollars for Hubway. Manager’s Agenda #10. A communication transmitted from Louis A. DePasquale, City Manager, relative to Awaiting Report Item Number 17-114, regarding a report on the plan for snow removal from the new bike infrastructure in the city. Manager’s Agenda #6. A communication transmitted from Louis A. DePasquale, City Manager, relative to a Planning Board recommendation to adopt the Beekeeping Zoning Petition with proposed amendments to the petition. Manager’s Agenda #8. A communication transmitted from Louis A. DePasquale, City Manager, relative to Awaiting Report Item Number 17-118, regarding a report on an update on the City’s plan to expand the curbside composting program citywide. Sundry communications on the closing of Petco and appeals to rescind the ban on non-rescue animal sales. Kathy was my neighbor and a friend to all who knew her. There are a number of additions this otherwise decent booklet could use. For example, bicycles should be equipped not only with lights but with sufficiently bright lights that are not obscured by clothing, backpacks, or anything else. It’s stunning to see how many cyclists have dim lights or no lights at all. Batteries are not eternal. Dark clothing may be a great fashion statement, but it’s an invitation for disaster. I’m not sure what this is about but it has an ominous tone to it. Committee Report #1. A communication was received from Paula M. Crane, Deputy City Clerk, transmitting a report from Councillor Nadeem Mazen, Chair of the Neighborhood and Long Term Planning, Public Facilities, Arts and Celebration Committee, for a public hearing held on Oct 10, 2017 to discuss feedback on bike safety related issues, and to plan for future bike safety measures in the City of Cambridge. This was a meeting designed to not listen to anything the Chair didn’t want to hear. Communications & Reports from City Officers #1. A communication was received from Vice Mayor Marc McGovern, transmitting Opioid Working Group Report. Communications & Reports from City Officers #4. A communication was received from Tanya L. Ford, Executive Director, Cambridge Election Commission, transmitting the Final Official Results from the Municipal Election held on Tues, Nov 7, 2017 for City Council. Communications & Reports from City Officers #5. 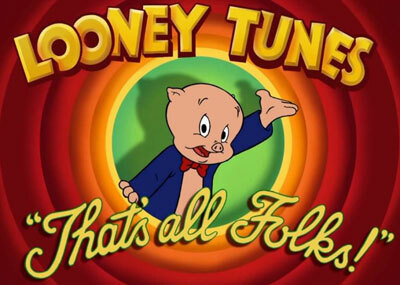 A communication was received from Tanya L. Ford, Executive Director, Cambridge Election Commission, transmitting the Final Official Results from the Municipal Election held on Tues, Nov 7, 2017 for School Committee.